I hope you're all having an enjoyable weekend. We have survived Nemo here in CT - take a look at a few of my storm photos here. For those of you who are new followers from the KitchenAid giveaway, Welcome and Thank You for reading - you should definitely take a look at this linkup I'm doing today - it's a lot of fun, especially if you're into photography. For those of you stopping over from the linkup, check out this great giveaway I'm participating in! And for those of you who are here day after day, you're the best and I appreciate you so much! Just a small part of a great swap package I received this weekend! Can't wait to share the rest of it next week. Short story for this one: Last time we lost power for a week, I found myself sitting at our dining room table doodling pictures [in the dark] of our china cabinet and different things in the house on envelopes. I was pretty proud of myself, so I put this one on the wall sconce next to our front door... it's been there ever since haha. Made and mailed some Valentine's Day cards for friends, family members, and Mike's goddaughters this weekend! It is. For sure. Every time we go to Chili's [in addition to getting this] we ALWAYS bring a molten lava cake home. That way we can enjoy it when we're not so full! And as always, linking up with Ashley! I absolutely adore your work of art! The small things is perfect. As many times as I've been to Chili's I've never had the molten lava cake...that needs to change. Have a blessed Sunday. If I ever drew anything recognizable, I'd have it framed! I love that you propped your sketch up on the sconce. My favorite is your window series. Glad you got out to enjoy that snow. Happy digging! Nemo sure left us a little snow to deal with! Great shots! Wonderful take on small things. And work of art looks delicious! Those pics out the window are gorgeous! Glad you survived the storm! These are fun and I really like your illustration as well as the time-elapsed window shots. My daughter is at college in the Boston area and pictures from her were impressive - reminded me of olden days when we got tons of snow and walked up hill both to and from school. 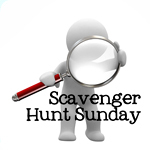 Thanks for joining in this week's scavenger hunt. That dessert is to die for. SO yummy! The snow in the pictures is gorgeous. I saw snow or the first time this weekend and I loved it!